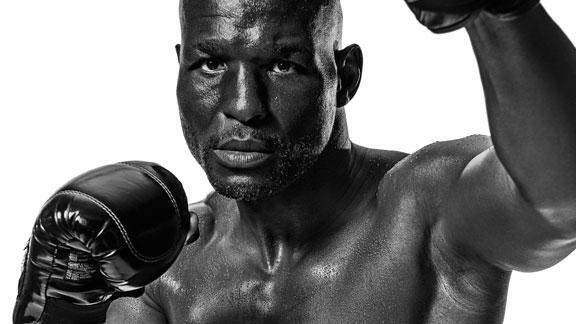 After losing his title to Jermain Taylor in 2005 and failing to regain it in a rematch the same year, Hopkins achieved further success when he moved up to light heavyweight and won the IBO and Ring titles from Antonio Tarver at 42 years of age. Two defenses of the Ring title were made before a loss to Joe Calzaghe in 2008. Three years later, Hopkins defeated Jean Pascal for the WBC and lineal light heavyweight titles, as well as regaining the Ring title. This made Hopkins the oldest boxer in history to win a world title, at the age of 46, breaking George Foreman’s record set in 1994. Hopkins later broke his own record by winning the IBF light heavyweight title from Tavoris Cloud in 2013 and again in 2014 when he won the WBA (Super) title from Beibut Shumenov, at age 48 and 49 respectively. Nicknamed “The Executioner”, and later “The Alien”, Hopkins is known among observers for his longevity and ability to continue competing successfully at an advanced age. Widely considered one of the greatest boxers of the modern era, he is a highly strategic and defensive boxer known for carrying good speed and power along with counterpunching skills. He credits mastering the boxing fundamentals and a great defense for his longevity in the sport. He is also a very seasoned fighter, being able to take advantage of a wide variety of situations in the ring and implement rough and dirty tactics while fighting on the inside or in a clinch. In the last years of his active career, Hopkins also became a minority partner with Golden Boy Promotions.